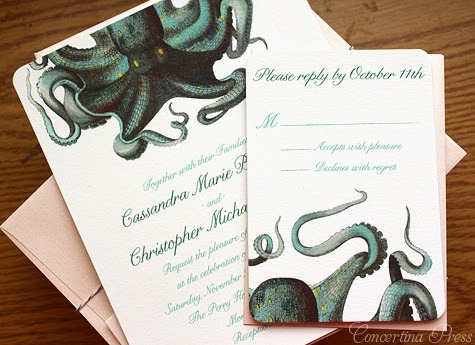 Octopus wedding invitations are fun and different for beach weddings (let's hope you don't see any on the beach!) and if you're having a wedding at an aquarium it fits the ambiance perfectly! I did the variation you see above for Cassandra and Christopher's peach and green wedding - I changed the color of the text to be more green instead of aqua, and the envelopes were a lovely pale blush pink with shimmer. Perfect for their November California Wedding. 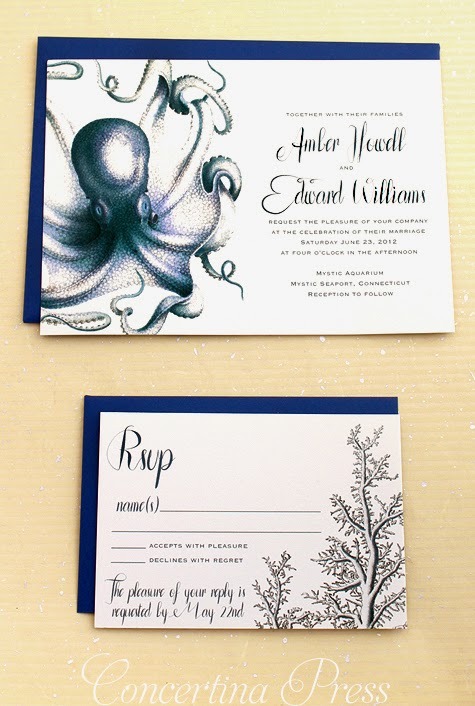 Below are my very popular navy Octopus wedding invitations - I've also done them in black and white. 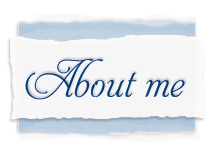 If you're interested in octopus wedding invitations for your wedding, visit my website to purchase samples or contact me!